Do you ever stop to think about the ‘why’ behind what you do every day? As entrepreneurs, many of us focus too much on the ‘how’ and ‘what’ of our careers, but we never drill down deeper to discover why we want to own our own company. We want to know how to build a seven-figure business and we hone in on what services we will offer to get us there. However, many don’t step back and focus on the core questions of why you want to start your own advice-based business to begin with and how that may be affecting your vision of being successful. If you don’t start with your why, it’s easy to get distracted on your path to success. You may experience self-doubt, lose track of how far you’ve come on your journey, or even find that when you achieve success, it feels empty. So how come the why matters so much? It’s all about knowing ourselves, our values, and what is truly meaningful in our lives. Living a life of intention is based on these core pieces of knowledge and, without them, we’re destined to feel directionless and unfulfilled. Here are more in-depth reasons why finding your why is crucial as an entrepreneur. It Gives Us Purpose and Direction Do you know what you’re truly working for every day you go to the office? Some would immediately say ‘money’, but money is rarely the motivating factor for starting a business. More than likely, you’re striving for freedom, security, or the ability to help others. Knowing this helps you ensure you’re on the right path and allows you to not worry about the small stuff that is bound to trip you up as you go about your workday. It Helps Us Inspire Our Clients and Team Members If you don’t know why you do what you do, how are your clients or team members supposed to get on board? As an entrepreneur and mentor, you are a leader both to those you serve and those you employ. When you know your why, you can inspire others to share in your vision and work with you toward a common goal that benefits everyone. It Helps Us Make the Right Decisions Tough decisions are just par for the course when it comes to being an entrepreneur. However, when you are clear on your why, those decisions suddenly become much easier to make as you can determine which course of action best lines up with your core values and vision. 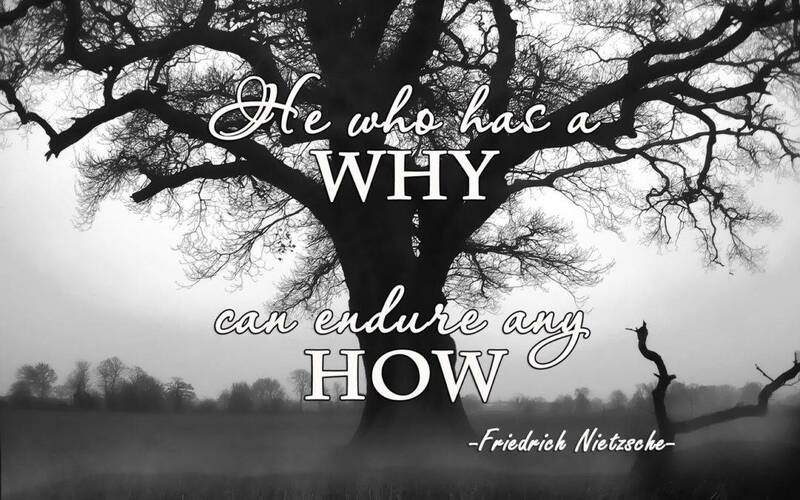 So what do you do if you have no idea what your why is? Fortunately, it’s not that difficult to figure out once you know what to look for. Whether you’re getting ready to start your business or are already building your firm, here are three questions you can ask yourself that will help you clarify your vision. What Makes You Feel the Most Alive? We all know how it feels when we’re in the ‘flow’ of doing something that ignites or passion. Time seems to slip by quickly, we don’t get sidetracked, and we feel an enormous sense of accomplishment once we’re finished. Take a moment to think about the moments when you feel like this and what you’re doing at the time. This is a good indication that you’ve found something deeply meaningful. What Have You Always Been Good At? What type of activities have you gravitated toward since childhood? We’re naturally drawn to things we’re good at and that fulfill us and capitalizing on these innate strengths is a reliable path to finding your why. Ask Yourself the Deathbed Question Okay, so no one wants to think about their inevitable death, but when you frame questions in this way, you can gain some big insights. Picture yourself on your dying day and ask yourself the question: what impact did I have in this life? This will help you distill what you truly want to accomplish and what legacy you want to leave behind. Your why will undoubtedly be different than anyone else’s, and it’s imperative that you figure it out before you can truly be successful. Do you need some help figuring out your why or how to incorporate it into your business philosophy or overall plan? Please reach out, I’d love to help!